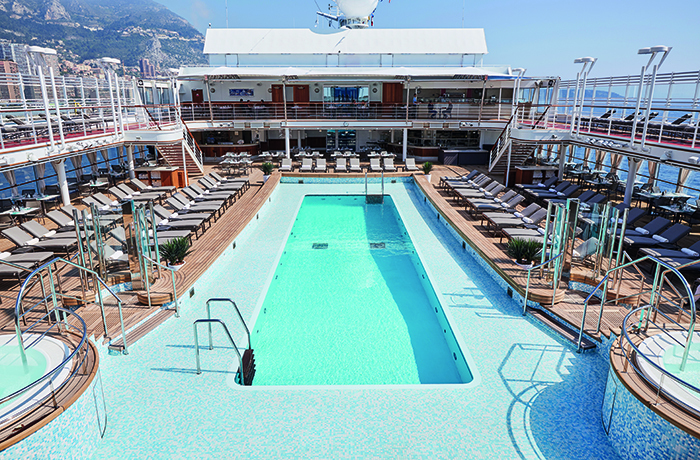 Silver Muse was christened in Monte Carlo, a suitably ritzy location for one of the world’s most elegant new ships. The ship is designed to feel intimate but at the same time spacious and this is something it achieves perfectly. All the suites (there are seven categories to choose from, including the lavish Royal, Grand and Owner’s Suites) are superbly appointed with marble bathrooms and full-size baths as well as showers, private teak verandas and walk-in wardrobes. 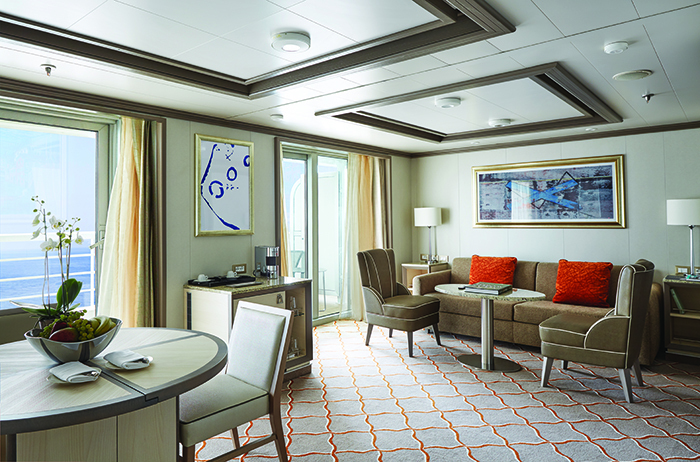 The design of Silver Muse is a masterclass in understated luxury. Décor throughout is in sophisticated hues of silver, gold, cream, chocolate, moss green and rose, creating a seductive boutique hotel ambience. 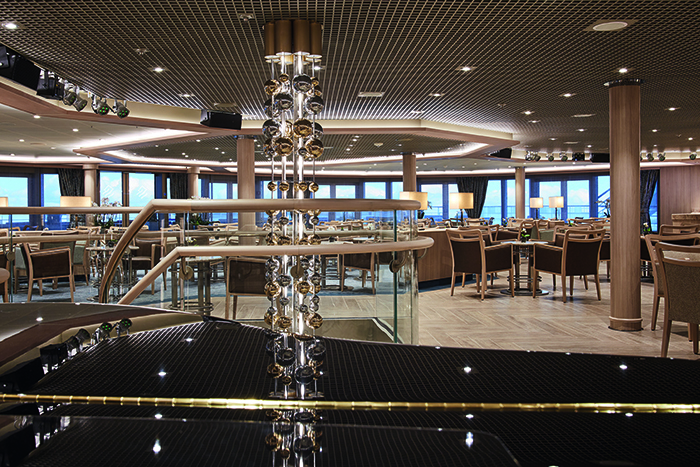 With capacity for just 596 guests, the ship’s public areas are inviting and relaxing. Particularly impressive is the pool deck, with its teak deck and fabulous, huge pool. The Panorama Lounge is the ideal place to meet for an aperitif, and has outdoor seating so you can enjoy the sunsets or recline after dinner on a balmy evening. 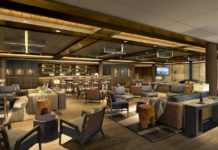 Tor’s Exploration Lounge (named after the Chairman of Viking Cruises, a friend of Silversea’s Chairman Manfredi Lefebvre d’Ovidio) offers panoramic views and plenty of seating to curl up with a book. The cabaret-style Venetian Lounge is a fantastic space for entertainment, while the Arts Café offers constantly changing exhibitions and at night transforms into a cocktail lounge. Restaurants include Kaiseki, a first-class Japanese restaurant with a range of teppanyaki, sushi, sashimi and other Asian-inspired dishes; Atlantide, a wonderful bar and grill with one of the most creative menus we’ve seen at sea; and Silversea favourites such as La Terrazza, with the opportunity to dine al fresco on freshly-made, authentic Italian cuisine. Other highlights include the Zàgara Beauty Spa, which is a haven of tranquility, with floor-to-ceiling windows, an acupuncture suite, an outdoor whirlpool, Mood Room and excellent Elemis treatments. The reception area could be a little more obvious, perhaps – it feels tucked away and is not very big; but this is a minor point. 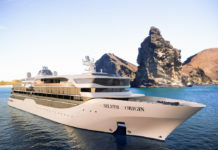 Silver Muse is without doubt one of the best new ships to set sail this year, and sets a new benchmark in luxury cruising. GETTING THERE: A nine-day Barcelona to Civitavecchia (Rome) cruise, departing 20 May 2018, starts from £5,500pp. 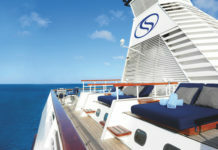 Calls include Monte Carlo in Monaco for the Grand Prix and Livorno in Italy (0207 340 0700; silversea.com).